Between 1937 and 1942 Stetson headed the Florida Writers Project unit on folklore, oral history, and social-ethnic studies for the Works Progress Administration, hauling around the state a sound recorder the size of a large coffee table to capture the songs, tales, and anecdotes of pogey fishermen at May port, railroad gandy-dancers, Latin cigar makers, Greek spongers, and turpentiners. Among the results was what Stetson today calls, "...A sort of barefoot social history of Florida". 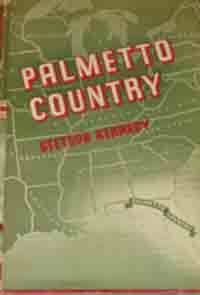 Stetson's first book, Palmetto Country, appeared in 1942 as a volume in the American Folkways Series edited by Erskine Caldwell. Of it, folklorist Alan Lomax has said, "I very much doubt that a better book about Florida folklife will ever be written." To which Kennedy's self-described "stud buddy" Woody Guthrie added, "I don't know of a book on my whole shelf that hits me any harder than your Palmetto Country. It gives me a better trip and taste and look and feel for Florida than I got in the forty-seven states I've actually been in body and tramped in boot. If only, and if only, all out library books could say what you did - the jokes and songs and old ballads about voodoo and the hoodoo and the bigly winds down in your neck of the woodvine." Anyone who has seen the Deepest South-Florida and the southern portions of Georgia and Alabama-knows that there lies the Palmetto Country. Folks outside the region usually think of the palmetto as the tall palm which is locally called the swamp cabbage or cabbage palm. Rearing its tawny head like a shaggy-maned lion on the African veldt, this majestic palm gives the Palmetto Country much of its tropical singularity. An old-timer once described it in these glowing terms: "I tell you, there's no tree like the cabbage palm. It never dies of old age, and you can't see the end of it lessen you cut it down. The sun can't wither it, fire can't burn it, and moss can't cling to it. Have you seen one bend before the wind, lay all its fans out straight, and just give so's the wind can't find nothin to take hold of?" "We now came to plenty of the tree palmetto which the inhabitants call cabbage tree and is much eaten raw and boiled. We felled three tall palms and cut out the top bud, the white tender part or rudiments of the great leaves. This tender part will be three or four inches in diameter, tapering near a foot, and cuts as white and tender as a turnip. This they slice into a pot and stew with water, then when almost tender they pour some bear's oil into it and stew it a little longer, when it eats pleasant and more mild than cabbage. Our hunters eat it raw and live upon it several days. The long trunks when split in two make excellent troughs or conduits to carry water above ground." These things were taught to the pioneer settlers by the Indians, who not only ate the palm's bud, but also made molasses from its berries. When hard-pressed for bread-stuff, the Indians managed to beat a kind of flour from the palm's foliage, and from its trunk they obtained salt by a process similar to that used in making potash. Modern natives, both black and white, are still fond of swamp cabbage They also gather the buds for sale at three cents each, and the buds are then canned and shipped to appear on America's ultra-swank menus as "Heart-of-Palm Salad," usually at a dollar a plate. Nature-lovers and conservationists take alarm at the fact that the removal of the bud causes the death of the palm, which may have been a hundred years in the making. The cut trunks of this and other palms are called palmetto logs, both within and without the region. They attracted national attention during the Creek and Seminole Wars, when they were used in the construction of fortifications-the spongy wood absorbed bullets and even cannonballs without splintering. Before that, Indians and settlers had used the logs for all kinds of construction. The fans are still used for thatching, and the logs for pilings, as they are virtually immune to destruction by marine worms. The word palmetto is probably derived from the Spanish palmetto, meaning diminutive palm, and is so used by Southerners. Shrub-like saw palmetto underlies the pine flat woods from Florida northward into South Carolina and westward to Louisiana. Originating in the swamplands, it eventually planted its feet on higher ground, burying its reclining root-stem beneath the soil to escape destruction by fire. To folks who live among them, palmettos are a major problem in clearing land. Stetson Kennedy was head of the Florida Writers' Project unit on folklore, oral history, and socio-ethnic studies for the Works Progress Administration between 1937 and 1942. He traveled the cities, towns, and rural backwoods of Florida collecting oral histories, songs, and stories from a diverse cross-section of people. His work resulted in one of the first volumes in the American Folkways Series edited by Erskine Caldwell, and remains a unique and important documentation of the social history of Florida.